Liebherr expands its L1 series and presents the L1-32 at Bauma 2019. The powerful lightweight crane is particularly characterized by its efficient transport logistics and its flexible ballast concept. As the big brother of the L1-24, the L1-32 has another decisive advantage: because of its maximum four-tonne load capacity, it can hoist even larger pre-fabricated elements such as concrete steps. In addition, the new hydraulic fast-erecting crane has a maximum radius of 30 meters and still lifts 1,050 kilograms at the jib head. It has a standard hook height of 21.3 meters. With these features, the L1-32 is especially suitable for the construction of larger detached and semi-detached properties as well as smaller apartment blocks. As a rule, two trucks are needed for transporting cranes in this class. However, with special attention given to logistics, Liebherr has made it possible to deliver the crane to its construction site using just one transport vehicle. In this case, the crane, with its low-speed axle and five tonnes of basic ballast as well as ten tonnes of additional ballast, can be transported to a site via a standard three-axle towing vehicle. As a result, the crane is fully deployable – with only a small adjustment of the load curve needed for a jib head load and maximum lifting capacity of 1,050 kilograms or four tonnes. For unrestricted use, two further tonnes of ballast are required, so 17 tonnes of ballast in total. In connection with the low ballast weight, the slewing radius is also significantly low at only 2.2 meters. The support dimensions are also almost as compact as those of the L1-24 at 4 x 4 meters. The L1-32 features the most state-of-the-art drive and control technology in its class. Thanks to Speed2Lift, loads can be lifted in pure 2-line operation with the help of a powerful FC hoist gear motor, meaning that re-reeving is not required. 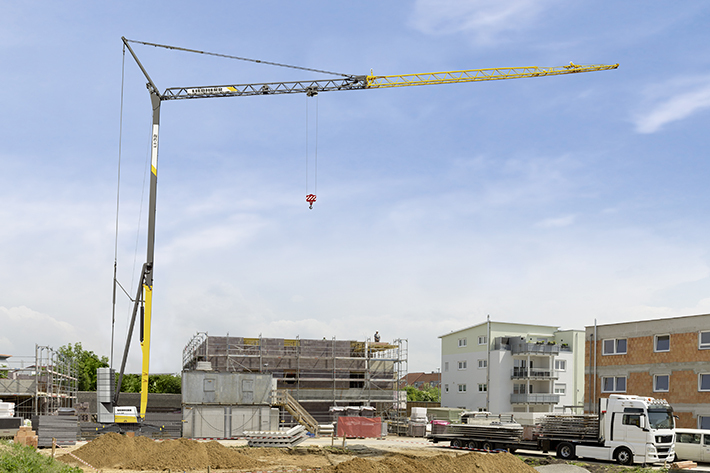 As a result, the crane can always be operated at a maximum hoist speed – and that with a lifting capacity of up to four tonnes. With the help of the proven Micromove fine positioning mode, the crane operator is able to accurately and safely position heavy loads such as pre-fabricated concrete elements. Further functions such as the ABB operating-range limiting system, oscillation damping and wind force moment control ensure increased site safety. Added to this are comfort functions such as state-of-the-art radio remote control with color display, which provides the crane operator with all relevant information at a glance.